Sir James brought to the political arena the same energy and clear thinking that won him success in the business world. His political career spanned over twenty years, and included campaigning for the Tory party in the 1975 general election, being knighted by outgoing Labour Prime Minister Harold Wilson in 1976, leading the French L’Autre Europe party in the early 1990s, and setting up his own independent UK political party, the Referendum Party, for the 1997 general election. The majority of his campaigning was focused on the Maastricht Treaty and the proposed European Union. Many of the lessons Sir James learnt in business were applied to his arguments against the way the European Union was being constructed. Sir James hated strong centralised control in government, believing it inefficient and dangerous. He also believed the social consequences of bad policies could be even more destructive to countries than they were to companies: if companies failed, then the shareholders lost; but if entire countries pursued misguided policies, then entire societies could be devastated. The success of his most successful and influential book, Le Piege led to his co-founding the political party L’Autre Europe. The book, published in France in 1993, took the form of a discussion with the economics editor of Le Figaro, in which Sir James outlined the dangers of global free trade and industrialised agriculture. 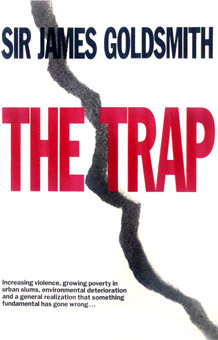 Le Piege became a surprise bestseller and was quickly translated and published in England as The Trap. Following the publication of Le Piege, Sir James was asked by Philippe de Villiers, the conservative politician of the Vendee Department, to join him in campaigning on these issues. Sir James headed the new political party, L’Autre Europe, which was against free trade but supported free trade within European borders. Other key party figures included Charles de Gaulle, grandson of the great statesman, and Thierry Jean-Pierre, a young judge in charge of corruption investigations at the Ministry of Justice. Denied access to television and advertising by the Gaullists and the socialists, Sir James produced his own newspaper and delivered copies to every household in France. Public support grew, and the party shocked Gaullists, National front and Socialists by winning 12.3 per cent of the national vote – enabling Sir James to lead thirteen French MEPs to Strasbourg, all of them anti-Maastricht, anti-GATT and anti-nuclear. He then decided Britain needed a similar campaign to force the major political parties to call a referendum on Europe before it was too late. 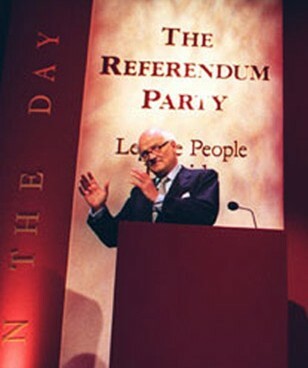 Sir James formed the Referendum Party to contest seats in the UK’s 1997 General Election, concentrating on a single issue: forcing a referendum on whether Britain should continue to be a member of the European Union. Sir James wanted the British electorate to decide for themselves what Britain’s relationship with Europe should be. Backing the party with £20m of his own money, Sir James himself stood as a candidate in Putney. He captured 3.5 per cent of the vote, helping defeat the pro-EU Cabinet Minister, David Mellor, who lost his seat to the Labour candidate. However, despite the party polling 800,000 votes, making it the fourth most successful party in the 1997 election, it did not win a seat in the House of Commons. Nonetheless, the Referendum Party had pressured both major parties into committing themselves to a referendum, and it was that commitment which was to keep Britain from joining the Euro. The party also laid foundations for other Eurosceptic movements such as the Democracy movement, founded by Sir James’s widow, Lady Annabel Goldsmith. Read and watch more about the campaign here.